There’s always a little vicarious thrill that comes when the real world enters into the reality of a game, no matter how mildly. Whether it’s as simple as seeing local landmarks worked into the landscape of your racing game, or having a digital opponent make fun of you for the other games you’ve been playing, that intrusion of the real into the fictional can make for strangely intriguing fun, a trick that series like Mr. Robot have spent years exploiting. And it’s arguably the primary hook of Hunt A Killer, the mail-delivery puzzle game that brings home the threat of a crazed murderer—literally. For those not already part of the online forums and public meet-ups for subscribers to this game, it’s a fairly straightforward setup: After signing up, you receive the first of a series of monthly boxes delivered to your doorstep. Most games have between six and eight “episodes,” meaning the whole thing can last up to the better part of a year. (The company also has a couple of all-inclusive box options, containing stand-alone mysteries with everything you need to solve a case already packed right in.) It tells the fragmented, elliptical story of unusual death—and it’s not always clear who the killer is, exactly—and through a series of clues, puzzles, codes, and more, you start to unravel the full narrative behind whatever is going on. The best aspect of the game is how it takes collaborative participation to a new level. While there’s still a visceral thrill to be had in spending solitary time scouring the internet for references to a particular musician mentioned in an imprisoned mental patient’s letter, or trying to assemble a series of illustrated body parts in the right order to crack a typographical code, doing it collectively is a far richer experience. Whether it’s sitting side-by-side with a fellow investigator, bouncing ideas off each other as to what an item in that month’s box could mean, or hooking up with an online group to propose solutions to the latest confounding series of messages, the sense of cooperation fostered by the process is invigorating. 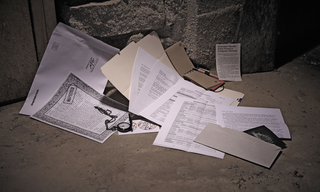 You can even reach out to people who aren’t playing the game, but may have specialized knowledge in a particular area—unsurprisingly, most folks get a kick out of doing their small part to help you uncover a killer. For one set of clues, detailing a map of the U.S. in order to trace driving routes between major cities led to a breakthrough in another area of the puzzle. And a series of recurring characters, each their own unreliable narrator as they provide disparate pieces of a larger story taking place in a remote facility, often name-check current events, historical landmarks, or simply allude to the fact that, for all intents and purposes, this adventure is happening in real time, in your world—with each box containing the tangible elements to prove it. It’s a cheap and easy way to facilitate the adrenaline rush that comes from feeling a sense of actual stakes, but it works wonderfully. And the company now offers a new horror-based paranormal story, Empty Faces, that I can’t wait to start. While being part of a collective is a mainstay of tabletop games and more, there’s something about the real-world setup and the way in which non-players can still aid in the detective work of Hunt A Killer that makes it feel vibrant and wholly unique. Sure, there are elements that are frustrating: When cracking codes in order to reveal passwords, certain online files you need to access will sometimes requires proper capitalization of words, necessitating multiple experiments with the caps lock key that don’t have any real bearing on the puzzle you solved. And certain clues are extraneous. We spent half a weekend trying to determine the relevance of an item included in one of the boxes, only to realize it held no meaning at all, save for being an interesting tchotchke loosely tied to the symbolism of the story. (Luckily, online recaps are available if you’re tearing your hair out over a particular clue.) Still, the overall game is extremely gratifying in a manner that exceeds my usual sense of satisfaction at completing a puzzle-based console or mobile game. It’s tactile, ongoing, and the answers sometimes come to you at 3 in the morning—and depending on their level of commitment, your fellow gumshoe might welcome a late-night text celebrating your discovery. Who doesn't love a serial killer?